Most days Watson will have scrambled eggs for breakfast with spirulina or herbal tea. 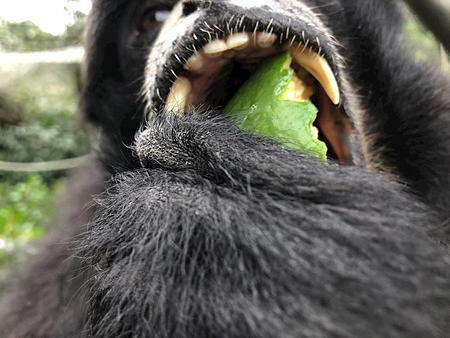 Although she would like to entirely commit to the animals' diet in order to draw attention to the endangered primates, she cannot consume leaves like they can. "I'm unable to do that as part of my diet because humans can't break down nutrients like gibbons do from leaves," Watson conceded. While it seems like a fine cause, it seems to me like it's cheating just a bit to eat cooked food. 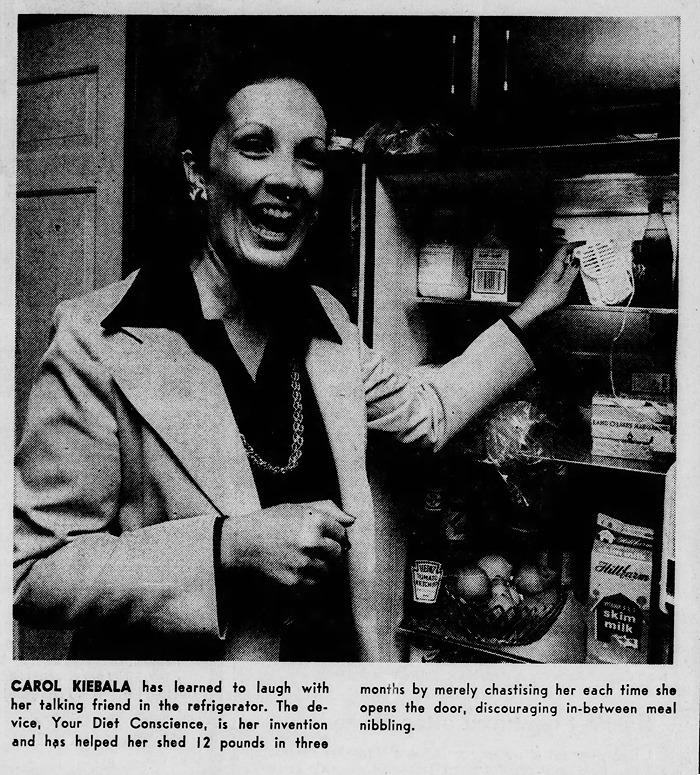 Carol Kiebala invented a dieting gadget that would verbally chastise you whenever you opened the refrigerator door. I guess that would encourage you to eat more potato chips, and other non-perishable snacks. 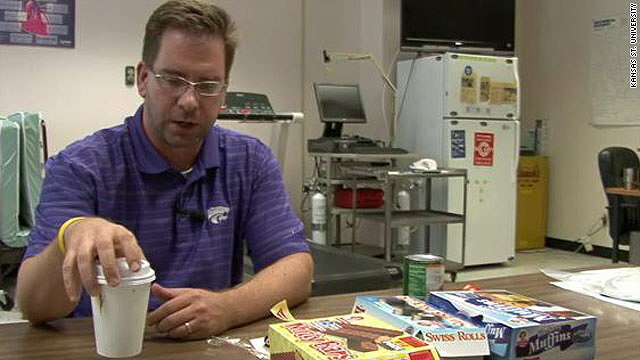 It describes itself as the diet for "wine lovers that refuse to give up wine while losing weight." It consists of about 10 eggs a day, and wine. As the site notes, "Wine only have 600 calories per bottle. So compare that to a normal blt sandwich that has about the same. What would you rather have. The sandwich or a whole bottle of wine ?" 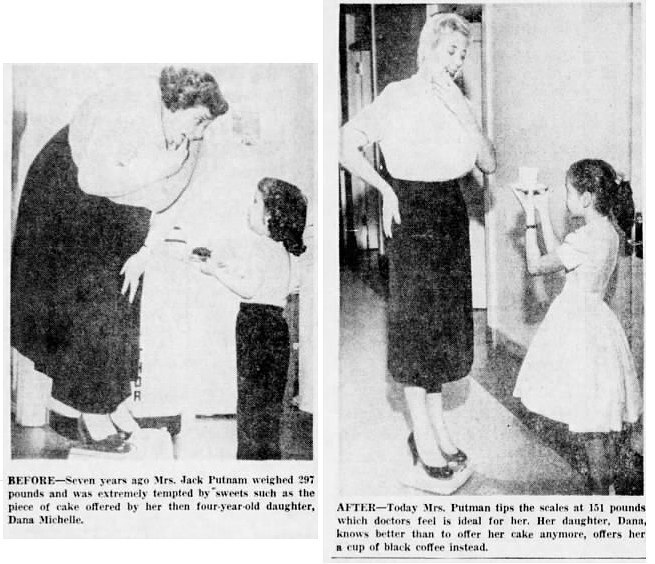 Nov 1959: Helen Putnam, a performer who went by the stage name "The Ten Ton Fun" (her theme song was 'All of me') was accepted into a weight-loss experiment conducted by Frank Tullis of the University of Tennessee. 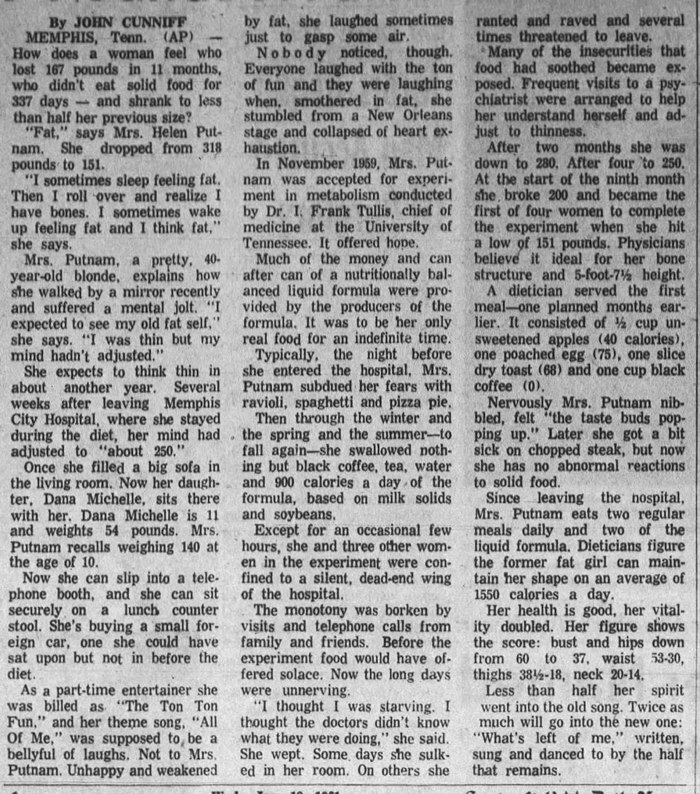 For the next 11 months she was restricted to a liquid diet consisting of nothing but black coffee, tea, water, and 900 calories a day of a milk and soy-based formula. Except for an occasional few hours, she and three other women in the experiment were confined to a silent, dead-end wing of the hospital. 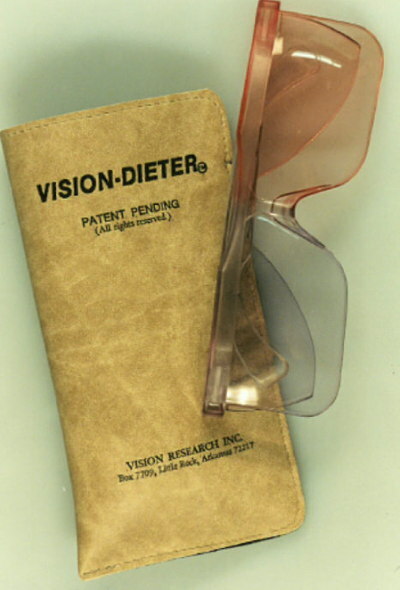 The monotony was broken by visits and telephone calls from family and friends... the long days were unnerving. "I thought I was starving. I thought the doctors didn't know what they were doing," she said. She wept. Some days she sulked in her room. On others she ranted and raved and several times threatened to leave. 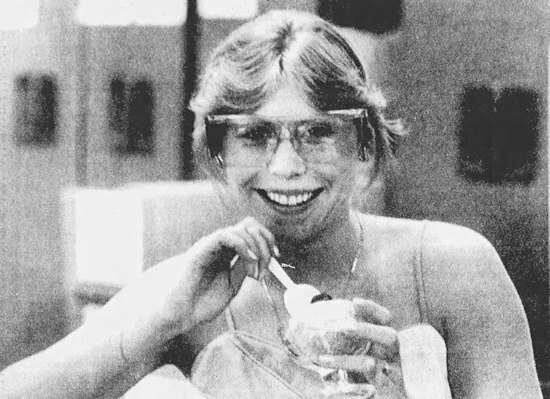 She dropped from 318 pounds to 151, and in doing so became the first woman to ever complete a metabolism experiment of this kind. I wonder if she managed to keep it off. I haven't been able to find any follow-up info about her. 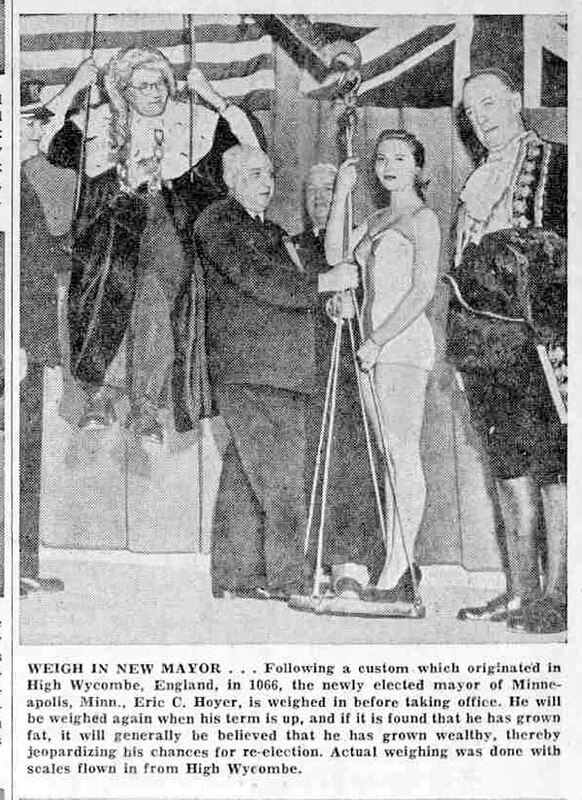 The town of High Wycombe in England has an ancient custom of weighing their mayors, first upon taking office and again at the end of their term. To have gained weight is taken as evidence that they've grown wealthy at the taxpayer's expense. 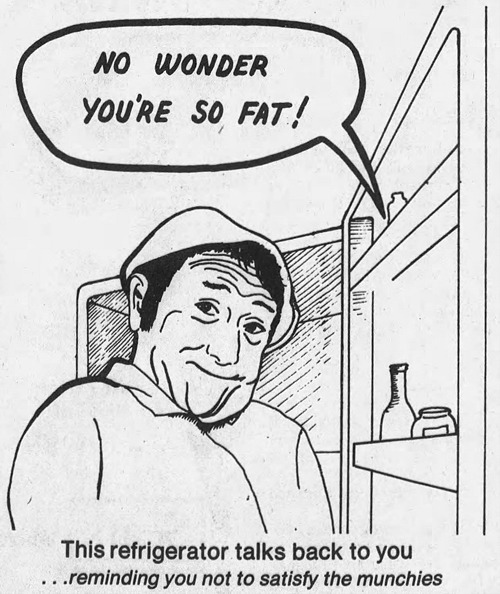 It's like an ancient form of fat-shaming. 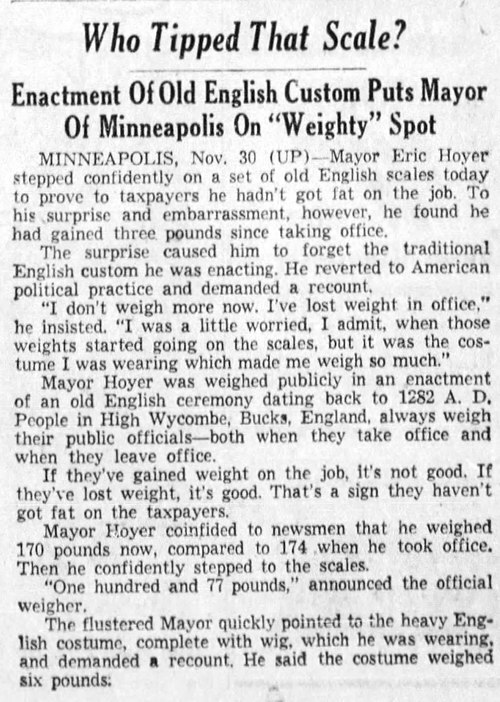 In the 1950s, the mayor of Minneapolis, Eric Hoyer, decided to adopt this custom. He even arranged to have the official scales flown in from High Wycombe. He apparently was pretty confident that he'd lost weight, but according to the scales he had gained some. He blamed the extra weight on the ceremonial costume he was wearing for the occasion. It's an interesting custom. Perhaps we should weigh more politicians periodically. Such as an annual weighing of senators and the president. 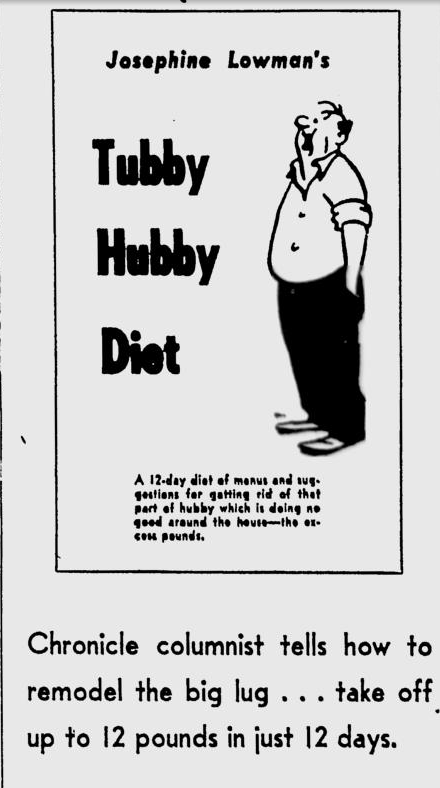 This diet from 1970 was simple. 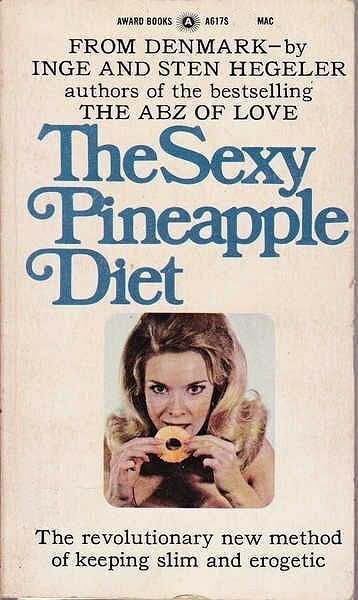 Just eat only pineapple for two days every week. On the other days you can eat whatever you want. The book is apparently quite a rarity, because I haven't been able to find any used copies for sale. 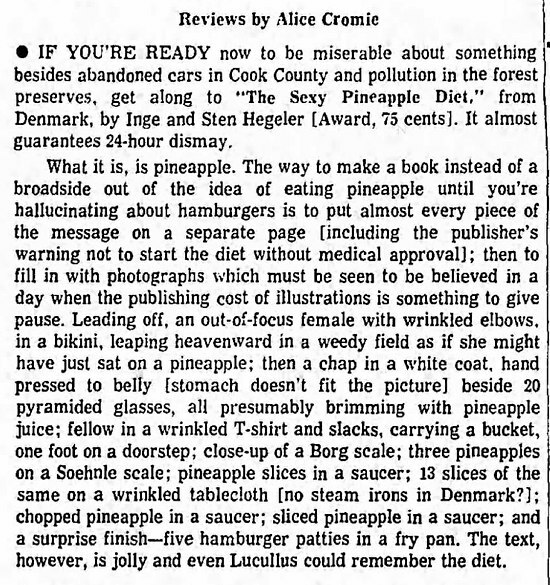 "Pineapple with whipped cream was the preferred dessert back then, so I thought, 'My god, I can have as much pineapple as I want for two days,' and that sounded splendid." And a bonus for linguaphiles: The word "erogetic" appears to have been invented for this book. I'm not sure what it means. What exactly is the mayonnaise diet? 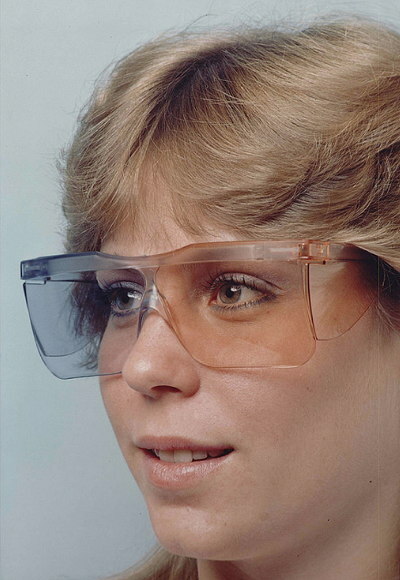 Googling the term produces various vague references to such a thing, but no specifics. 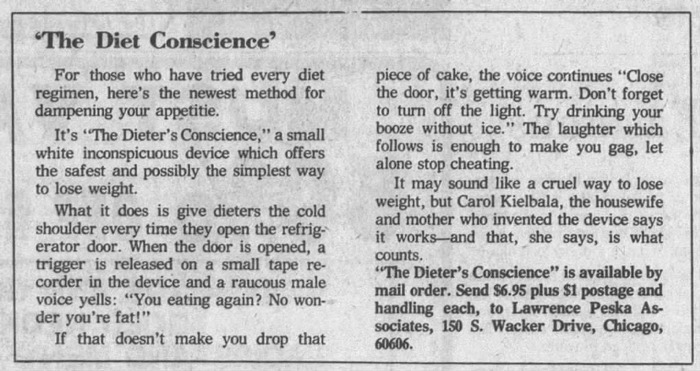 So, like the Dial-A-Dietitian, I have no idea what this diet involves... beyond a lot of mayonnaise and eggs. 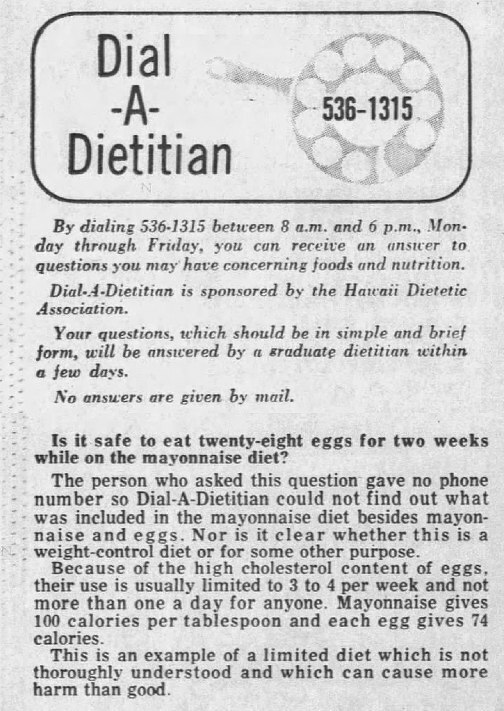 My guess is that it was either an alternative name for the Atkins Diet, or an eccentric variant of it, since the book Dr. Atkins' Diet Revolution first came out in 1972, which makes the timing about right for this person inquiring about a mayonnaise diet in 1974. I just cannot believe the arrogant sexism and objectifying behavior of Josephine Lowman! 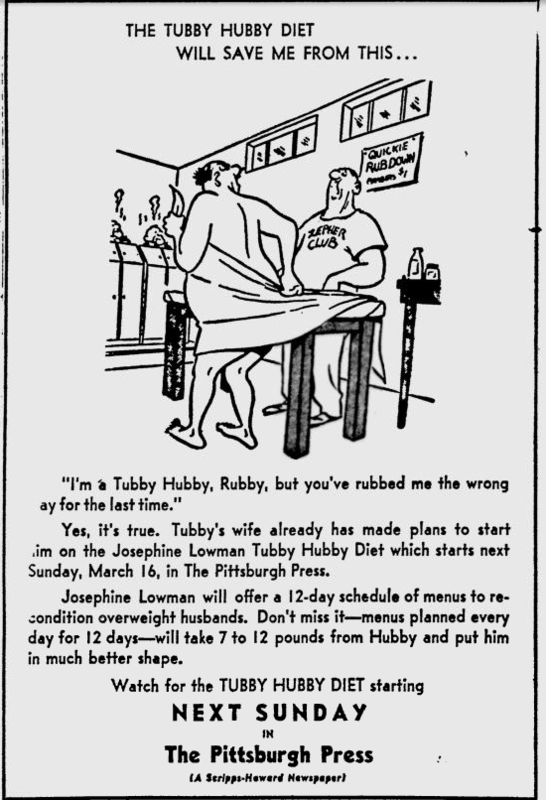 I feel cheap and soiled, on behalf of all tubby hubbies. LATE ADDITION TO THE POST: I could not resist adding this new term I just thought of: "schlub-shaming."